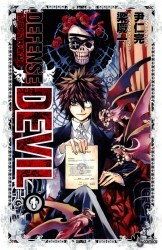 Synopsis: Adapted from the oneshot Akuma Bengoshi Kukabara, Mephisto Bart Kucabara is a devil lawyer. In order to return to the demon world that he was exiled from he needs to collect enough Dark Matter. To do so he creates a plan to claim the Dark Matter from the souls of sinners sentenced to hell. Prove the soul's innocence and the Dark Matter becomes his. But how can he gather enough Dark Matter when his kind personality causes him to continually use it up in order to defend the soul from the Shinigami that has come to take them to hell?